When it comes to mold, the MasterTech Team understands and appreciates the risk that you and your family are up against. That is why we have taken every measure to carefully train each of our inspectors and technicians to handle all cases of mold quickly and efficiently without compromising you and you family’s safety and best interest. MasterTech provides South Jersey home and business owners with the safest and most effective mold removal services in New Jersey. History of water issues, musty odors, and or suspicious staining or discoloration on materials in your Sewell, NJ home or business? You should consider calling a professional mold inspector in your South Jersey area to have your home inspected. A certified mold inspector in Sewell, NJ will complete a visual evaluation to identify any conditions that can promote mold growth. With the use of moisture meters and thermal imaging readers, your inspector will be able to isolate all damp building materials and track the course of the water migration to understand potential mold growth patterns. If necessary, samples can be collected for scientific analysis. Every mold problem is unique. 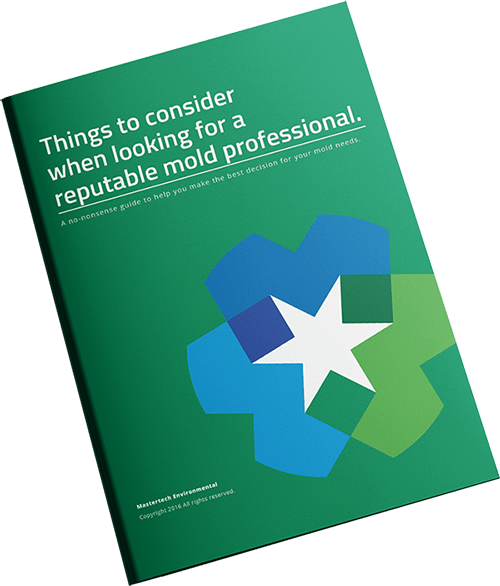 There are a multitude of factors to consider in each mold contamination. That is why it is so important that the scope of work for mold removal in Sewell, NJ is tailor-made to address your specific needs. However, there are some general goals of mold remediation. MasterTech has time to develop a mold remediation process that promises the safest, most efficient, and most effective mold remediation in Sewell, NJ from start to finish. Our 12 step process ensures control of the problem through proper containment and protection of your Sewell, NJ home or business. We take care to complete a thorough cleanup and proper disposal of all contaminated materials. Once the work it complete, we confirm the job was done right with post verification testing. 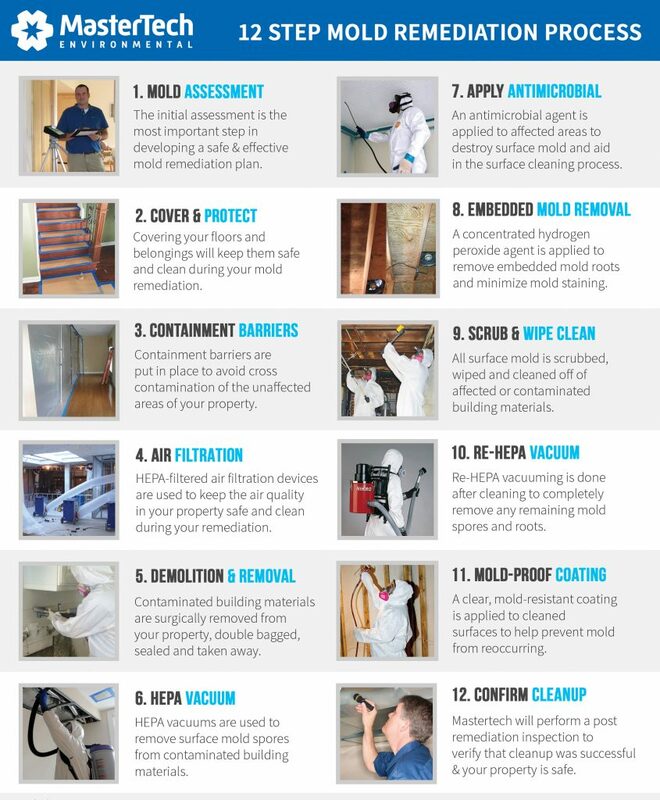 At Mastertech, our team of industry mold remediation experts have carefully developed a mold remediation process that incorporates the safest and most effective mold removal methods, products and equipment. As proof of our commitment to providing the highest quality of mold remediation services possible, our mold remediations are backed by a 5-year mold removal warranty. It is our promise that the mold has been effectively removed, and it will not return. A major floor or severe leak is not necessary for mold development. Conditions as mild and inconspicuous as humidity, condensation and poor air circulation can prove to be adequate water sources to cause and sustain mold growth. Most of your Sewell, NJ basement foundation walls are underground, so they tend to seep or leak moisture through tiny pores and cracks. Basements are typically constructed of cinder block, poured concrete or rubble walls. This leaves your walls vulnerable to leakage and seepage. The first sign of water intrusion is usually water staining or efflorescence. Efflorescence is the white, powdery substance that develops on the foundation wall surface. When water or vapor seep in through your foundation walls, it brings with it soluble salts and minerals. This leaves behind a white, powdery substance that often gets mistaken for mold. It is not mold, but it is a sign of water or moisture seepage which can lead to mold development. If you suspect mold or have damp conditions and a musty odor in your basement, call a basement mold removal professional in Sewell, NJ. Crawl spaces are the ideal breeding ground for mold development. Porous building materials and poor building envelope design provide the perfect conditions for mold growth in your Sewell, NJ crawl space. Many crawl spaces are poorly vented with undersized wall vents that make moisture and mold issues worse. In spring and summer, crawl space vents introduce warm air into cool crawl spaces causing condensation on wood and masonry building materials. The same effect happens during cold seasons – only in the opposite order. Crawl spaces can be difficult to access, and it may prove difficult for a homeowner to know what to look for in terms of mold. A trained crawl space mold removal professional in Sewell, NJ will have the necessary tools and experience to help. The combination of heat and poor ventilation can cause attic mold in Sewell, NJ. If not properly ventilated, moist air gets trapped and infuses itself into the attic sheathing and rafters. This moist air can also increase airborne mold spore levels which can settle into insulation and on belongings stored in your attic. Proper mold remediation techniques are important to ensure that attic mold doesn’t cross-contaminate the inhabitable areas below during cleanup. Our process also minimizes or eliminates dark staining left behind by moisture. For mold inspections and mold removal in West Deptford or mold inspections and mold remediation in Woodbury, NJ, call 1-800-310-3226.